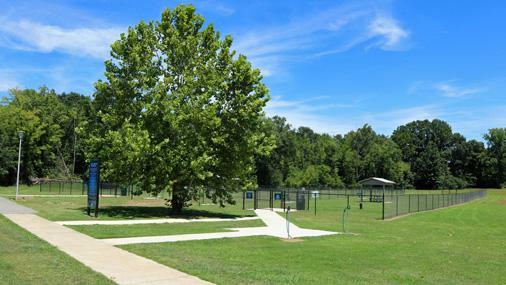 The Scottsboro Dog Park opened on June 13th, 2015, it is located at the Bynum Park Complex and is open to the public. Two fenced in areas, one for larger dogs, and one for small dogs under 25 pounds. An Open pavilion in each fenced in area. Three benches in each fenced in area. A dog bath in each fenced in area. Dog must be spayed or neutered by 12 months of age to play. This shows your commitment to ending pet overpopulation in our community and allows for safer play for all dogs and people. There are no exceptions to this rule. All dogs must have a current rabies vaccination and be free of fleas and intestinal worms. Owners must scoop their pet's poop. Aggressive dogs should be removed immediately. Dogs must be 16 weeks old and should have all their parvovirus vaccines completed. Animal Services will house any unattended dogs. For the safety of smaller dogs under 25 pounds it is recommended to keep them in the small dog area. Dogs must be leashed and under control outside of the park fences. Dogs must be unleashed inside the park. Children under 14 years of age are not allowed inside the park unless accompanied by an adult who is 19 years of age or older. You are liable for any injury caused by a dog under your supervision. Users assume the risk of injury to themselves and their dog/dogs.